Crafts and Cravings: Animal Antics at the Ink Spot! Animal Antics at the Ink Spot! Welcome to a new week! For me this is the first day of the week because my job allowed me the holiday off. It was a much needed day to play catch up around the house. I finally got the rest of the holiday decorations packed away and the floors swept and the groceries shopped for. Phew! To start off my week I was lucky to have Kelly challenge The Ink Spot design team to make a card with an animal on it. Extra points if it is funny! How did I do? 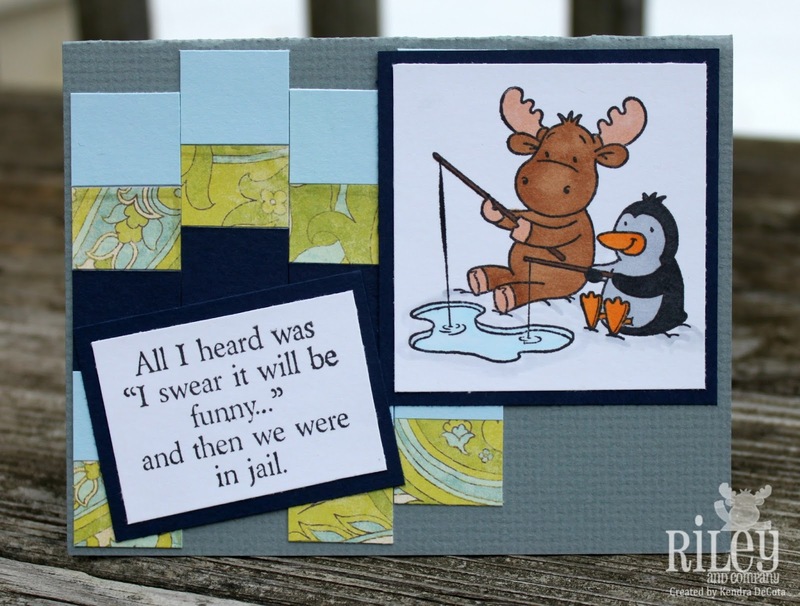 For this card I have used Ice Fishing Riley and Percy from the Riley and Company Stamp Line. I have also put that together with a sentiment called I Swear It Will Be Funny from the Funny Bones Stamp Line. The background was made from my paper scraps using a technique called Bargello that I found on Splitcoaststampers. I really like how it comes out, and it is super easy to make. Also make sure you like us on Facebook to keep up with the new happenings! I'd say you did just fabulous! What a fun and charming card!